Like many other cryptocurrency inspired HYIP programs, BITRush offers a combination of a lifetime investment opportunity and a single investment plan - 5.1% daily. However, pay attention that the initial deposit is not included in the payments. Initial deposit can be requested anytime for a 5% fee. BITRush accepts a variety of payment methods: Bitcoin, Litecoin, Ethereum, Dash, PerfectMoney, and Payeer. 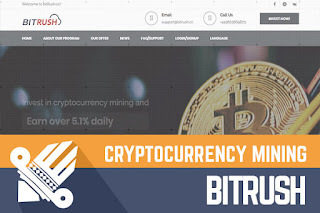 The minimum investment amount at BITRus is $5 (PerfectMoney, Payeer), 0.005 (Bitcoin), 0.05 (Litecoin, Dash, Ethereum), but the max. deposit limit is not set. In turn the minimum withdrawal amount for Perfect Money and Payeer - $0.10, Bitcoin 0.0001, Litecoin, Dash and Ethereum 0.0010. For accruals, BitRush offers a solution that's getting more and more popular among so-called cryptocurrency inspired programs lately - accrual payments that are added to your balance every 10, 5 or 1 minute depending on the deposit amount instead of once in 24h payments. Please note, that withdrawal requests are processed during the business hours 9 AM till 8 PM while on Sundays from 10 AM to 6 PM and can take up to 3 business days. Lately, I have been reviewing mainly cryptocurrency inspired programs that deal with trading or mining or both. Recently, only one program has offered a different legend in terms of the profit source. So, this review is no exception and we will take a look at another crypto inspired program and what it can offer to us. The first thing that’s clear about this program when you visit the website is – no fancy technological solutions for investments and withdrawals and no “posh” approach to the website and marketing strategy. BITRush admins have decided stick to the basics – one investment plan, the good old registration and a few standard selling points. 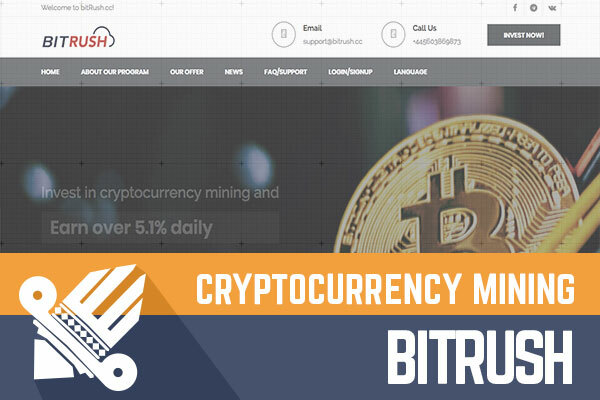 Like the admins write on the website – the main principle of BITRush investments – simple and wise. I would stick to the word simple to describe this program. However, the program may look simple, but don’t judge a book by its cover. Check out BITRush yourself and share your thought in the chat box below! In term of the legend, BITRush could be labelled as the old school cryptocurrency inspired program since its main focus is cryptocurrency mining instead of cryptocurrency trading or combination of both. According to the About Us page, the idea of BITRush was born back in 2016 among a few bitcoin enthusiasts, however just recently – a cloud-based mining service using a unique combination of many extraction algorithms. If some of you are interested to find out more about BITRush head to the program’s website and take a look at About Us, Our Farms and Our Team pages. Are you wondering what makes this program different from many similar ones? The admins have written a whole paragraph explaining why this project is unique. The main thing that they are highlighting is the accrual payment solution that adds profit to your withdrawal balance once in 10, 5 or 1 minute. I would say that this is a solution that’s getting more and more popular lately. However, it is definitely an advantage for those investors who are cautious and tend to request withdrawals regularly. So, let's take a look at the investment opportunity offered bu BITRush. For a lifetime investment offer, the investment plan of BITRush can be described as pretty generous – 5.1% daily. An investment of 0.058 BTC (approx. $200) would generate a daily return of 0.002958 BTC. With 5.1% daily, the break-even point is reached after 20 days, of course, in case the program will last for so long. As usual, the program offers a referral program. Today we are looking at another cryptocurrency mining program with a pretty generous investment offer. If it is still hard for you to choose the right one to invest in, feel free to take a look at this one. Probably some of the features offered by BITRush is something that worth considering. Is it really going to be a lifetime together with BITRush? Or potential investors have to guess the potential lifetime of the program to get the most out of it. As always it is impossible to tell what’s going to happen with the program tomorrow, next week or after a month. Therefore, if you ever decide to make any investments, don’t invest more than you can afford to lose! Have you already made an investment in BITRush and have any useful information to share with us? Please drop a message in the chat box to share your experience! Investment plans: 5.1% daily for lifetime. Withdrawal initial deposit anytime for 5% fee.